The 38 Year Old is the active leader in HRs with 1 current club (432 Hrs), and has been the foundation for the Southsiders for the time he has donned the uniform. It was a horrific beginning to his career in a White Sox uniform, on the heels of his 4 YRs/$56 MIL Pact before the 2011 campaign. The giant slugger hit just .159/.292/.277 in 2011, before he revived his career in 2012, by pasting 41 HRs and driving in 96 runs. The “Big Donkey” has now clubbed 101 HRs overall in 3 1/2 seasons, with a .732 OPS. His 2014 numbers are his best yet in the Southside of Chicago at .232/.366/.439 – with 15 HRs and 42 RBI. With just a $5 MIL remaining on his dough for the rest of the year, the 35 Year Old LHB should net the club a decent bounty on a trade in the next week. Adam Dunn‘s time is also coming quickly to an end – as he should be traded to a contending club. A recipient of a 4 YRs/$56 MIL deal, the 1st campaign an abysmal start. He has since regressed a little in both power and averages, but as far as a modern-day slugger, he is not far off the realm of what salary he draws. Alexei Ramirez may also have his peak optimal value for trading as well, however with his versatility, perhaps the franchise will keep him. It is too bad that Avisail Garcia was hurt for the majority of the year, as this acquisition was a catalyst in several other nice deals, in a short window that Rick Hahn has done to revitalize the youth of this squad.. The craziest Roster Tree definitely belonged to Tyler Flowers, who we traced all the way back to the Carlos Lee draft. The brass did a great job in also securing Adam Eaton and Mark Davidson from the Diamonbacks/Angels – in exchange for Addison Reed (subpar reliever) and Hector Santiago (marginal player in 2014, with just 2 pitches) as the key components leaving the fold. When you add in Abreu and Garcia, then you are talking about 4 long-term players that may be in your everyday lineup for Peavy, Reed and Santiago all combined. Peavy was costly and ineffective this year. Alex Rios was a nice player for your team – but when you consider the club never paid anything for him (other than his contract via a claim), turning him into Leury Garcia is not bad. Boone Logan and Javier Vazquez for Tyler Flowers I would do any day of the week as well. Gordon Beckham has shown flashes of decent offensive production, as has Dayan Viciedo. Again, I am sure you may be able to trade them in the next week if you so desire. Alejandro De Aza was also plucked off of waivers, so this shows a trend of the organization not spending a lot of assets in order to acquire players. No matter what happens with him, he has earned his keep up until this point. The White Sox are better just to wait out the age of the Tigers, and concentrate on building around Abreu. The great news is the team has lots of payroll coming off the books with Konerko and Dunn leaving after this year either way. Chris Sale is on a team friendly yearly contract through ‘2019’ – and this gives the squad a nice option to add many Free Agent Starters to the fold. Chicago has shown great strides in improving the viability of their roster going forward in a short time frame, and it is a classic example of a quick re-tool. Yes the franchise has made some bad deals along the way, but they have corrected most of the weaknesses in a timely fashion, and especially in the everyday offensive lineup. One of mt favorite Roster Trees of all time with this lengthy list of people run through the organization, dating back to Boone Logan, Javier Vazquez, to finally Carlos Lee. Flowers has not asserted himself as an everyday Major Leaguer yet, but he is still a young Catcher at 28, and has smacked 28 HRs and added 84 RBI in just 805 career AB. This is not power production at all. Adrian Nieto (24) C: December 12, 2013: Drafted by the Chicago White Sox from the Washington Nationals in the 2013 rule 5 draft. Tyler Flowers (28) C: December 4, 2008: Traded by the Atlanta Braves with Jon Gilmore (minors), Santos Rodriguez (minors) and Brent Lillibridge to the Chicago White Sox for Boone Logan and Javier Vazquez. Jon Gilmore (24) 3B/1B: October 17, 2012: Released by the White Sox, and out of organized baseball. Brent Lillibridge (30) SS/2B/OF: June 24, 2012: Traded by the Chicago White Sox with Zach Stewart to the Boston Red Sox for Kevin Youkilis and cash. Zach Stewart (27) P: July 27, 2011: Traded by the Toronto Blue Jays with Jason Frasor to the Chicago White Sox for Edwin Jackson and Mark Teahen. Jason Frasor (36) P: January 1, 2012: Traded by the Chicago White Sox to the Toronto Blue Jays for Myles Jaye (minors) and Daniel Webb. Myles Jaye (28) P: Is currently a starter with the AA Birmingham Barons for the White Sox. Daniel Webb (24) P: Has pitched with the White Sox Bullpen for all of 2014. Edwin Jackson (30) SP: July 30, 2010: Traded by the Arizona Diamondbacks to the Chicago White Sox for David Holmberg and Daniel Hudson. David Holmberg (23) P: Drafted by the Chicago White Sox in the 2nd round of the 2009 amateur draft. Daniel Hudson (27) SP: Drafted by the Chicago White Sox in the 5th round of the 2008 amateur draft. Mark Teahen (32) 3B/1B/OF: November 6, 2009: Traded by the Kansas City Royals to the Chicago White Sox for Josh Fields and Chris Getz. Josh Fields (31) 3B/1B/LF: Drafted by the Chicago White Sox in the 1st round (18th pick) of the 2004 amateur draft. Chris Getz (30) 2B: Drafted by the Chicago White Sox in the 4th round of the 2005 amateur draft. Kevin Youkilis (35) 3B/1B: October 30, 2012: Granted Free Agency. Boone Logan (29) RP: Drafted by the Chicago White Sox in the 20th round of the 2002 amateur draft. Javier Vazquez (38) SP: December 20, 2005: Traded by the Arizona Diamondbacks to the Chicago White Sox for Orlando Hernandez, Luis Vizcaino and Chris Young. Orlando Hernandez (48) SP: January 3, 2005: Signed as a Free Agent with the Chicago White Sox. Chris Young (30) OF: Drafted by the Chicago White Sox in the 16th round of the 2001 amateur draft. Luis Vizcaino (39) RP: December 13, 2004: Traded by the Milwaukee Brewers with a player to be named later and Scott Podsednik to the Chicago White Sox for Carlos Lee. The Milwaukee Brewers sent Travis Hinton (minors) (January 10, 2005) to the Chicago White Sox to complete the trade. (33) 1B: Never played baseball after the 2005 season. Carlos Lee (38) 1B/OF: Signed by the Chicago White Sox as an amateur free agent in 1994. 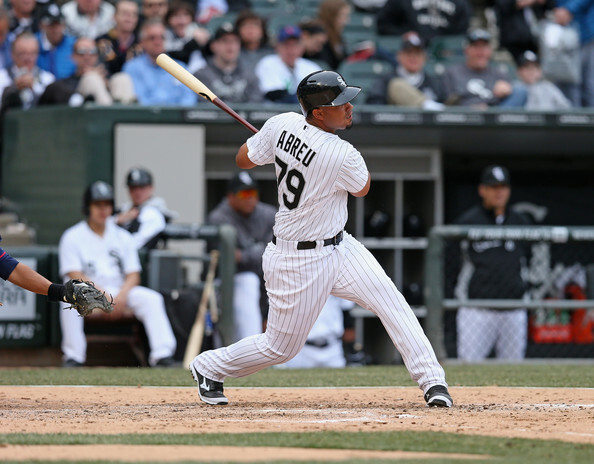 Jose Abreu (27) 1B: October 29, 2013: Signed as a Free Agent with the Chicago White Sox. 6 YRs/$68 MIL. Gordon Beckham (27) 2B: Drafted by the Chicago White Sox in the 1st round (8th pick) of the 2008 amateur draft. Conor Gillaspie (27) 3B/1B: February 22, 2013: Traded by the San Francisco Giants to the Chicago White Sox for Jeff Soptic (minors). Jeff Soptic (23) P: Drafted by the Chicago White Sox in the 3rd round of the 2011 MLB June Amateur Draft. Alejandro De Aza (30) OF: October 21, 2009: Selected off waivers by the Chicago White Sox from the Florida Marlins. Adam Eaton (25) OF: December 10, 2013: Traded as part of a 3-team trade by the Arizona Diamondbacks to the Chicago White Sox. The Chicago White Sox sent Hector Santiago to the Los Angeles Angels of Anaheim. The Chicago White Sox sent a player to be named later to the Arizona Diamondbacks. The Los Angeles Angels of Anaheim sent a player to be named later and Mark Trumbo to the Arizona Diamondbacks. The Arizona Diamondbacks sent Tyler Skaggs to the Los Angeles Angels of Anaheim. The Los Angeles Angels of Anaheim sent A.J. Schugel (minors) (December 13, 2013) to the Arizona Diamondbacks to complete the trade. The Chicago White Sox sent Brandon Jacobs (minors) (December 13, 2013) to the Arizona Diamondbacks to complete the trade. Brandon Jacobs (23) OF: July 12, 2013: Traded by the Chicago White Sox with cash to the Boston Red Sox for Brandon Jacobs (minors). Matt Thornton (37) RP: March 20, 2006: Traded by the Seattle Mariners to the Chicago White Sox for Joe Borchard. Joe Borchard (35) OF: Drafted by the Chicago White Sox in the 1st round (12th pick) of the 2000 amateur draft. Hector Santiago (26) SP: Drafted by the Chicago White Sox in the 30th round of the 2006 amateur draft. Dayan Viciedo (25) LF/3B: Signed by the Chicago White Sox as an amateur free agent in 2008. Marcus Semien (23) 2B/SS: Drafted by the Chicago White Sox in the 6th round of the 2011 amateur draft. 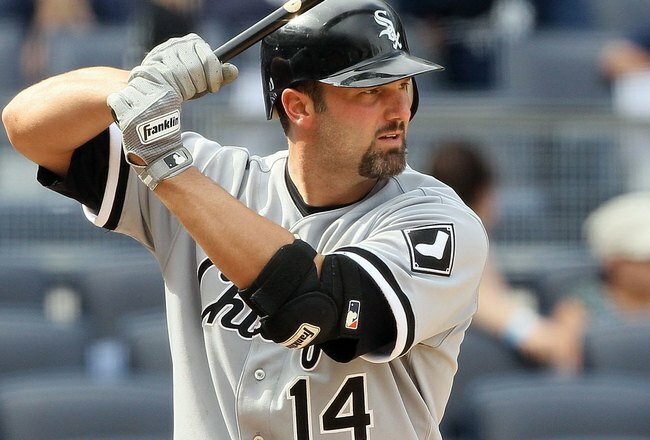 Paul Konerko (38) 1B/DH: November 11, 1998: Traded by the Cincinnati Reds to the Chicago White Sox for Mike Cameron. Mike Cameron (41) CF: Drafted by the Chicago White Sox in the 18th round of the 1991 amateur draft. Leury Garcia (23) 2B/3B/CF: August 11, 2013: the Texas Rangers sent Leury Garcia to the Chicago White Sox to complete an earlier deal made on August 9, 2013. August 9, 2013: The Texas Rangers sent a player to be named later to the Chicago White Sox for Alex Rios. Alex Rios (33) OF: August 10, 2009: Selected off waivers by the Chicago White Sox from the Toronto Blue Jays. Moises Sierra (25) OF: May 3, 2014: Selected off waivers by the Chicago White Sox from the Toronto Blue Jays. Jordan Danks (27) OF: Drafted by the Chicago White Sox in the 7th round of the 2008 amateur draft. Carlos Sanchez (22) SS: Signed by the Chicago White Sox as an amateur free agent in 2009. Avisail Garcia (23) OF: July 30, 2013: Traded as part of a 3-team trade by the Detroit Tigers to the Chicago White Sox. The Detroit Tigers sent Brayan Villarreal to the Boston Red Sox. The Chicago White Sox sent Jake Peavy to the Boston Red Sox. The Boston Red Sox sent Jose Iglesias to the Detroit Tigers. The Boston Red Sox sent Francellis Montas (minors), Cleuluis Rondon (minors) and Jeffrey Wendelken (minors) to the Chicago White Sox. Cleuluis Rondon (20) SS/2B: Is playing with the White Sox A+ affiliate Winston-Salem of the Carolina League. Jeffrey Wendelken (21) SP: Is a Starting pitcher with the White Sox A+ affiliate Winston-Salem of the Carolina League currently. Francellis Montas (21) P: Is a Starting pitcher with the White Sox A+ affiliate Winston-Salem of the Carolina League currently. Jake Peavy (33) SP: July 31, 2009: Traded by the San Diego Padres to the Chicago White Sox for Dexter Carter (minors), Aaron Poreda, Clayton Richard and Adam Russell. 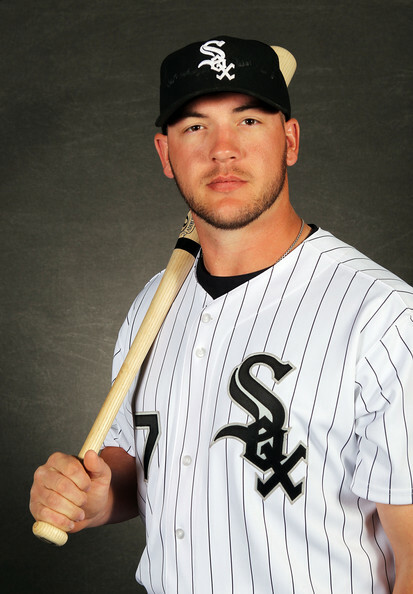 Dexter Carter (27) P: Mar.28, 2012: Carter was released by the White Sox, and is now out of professional baseball. Aaron Poreda (27) RP: Drafted by the Chicago White Sox in the 1st round (25th pick) of the 2007 amateur draft. Clayton Richard (30) SP: Drafted by the Chicago White Sox in the 8th round of the 2005 amateur draft. Adam Russell (31) P: Drafted by the Chicago White Sox in the 6th round of the 2004 amateur draft. Jose Abreu has far exceeded anyone’s expectations in his rookie year – with a MLB leading 30 HRs and 77 RBI in just 89 Games Played so far. With Masahiro Tanaka being out for injury, this Cuban power hitter should be a lock for AL Rookie Of The Year/ The 27 Year Old 1B also has a chance to possibly run down Mark McGwire’s 49 HR record set for rookies. Abreu needs 19 HRs over his last 58 games, – a pace he is right on for, with a HR about every 3 games. The White Sox inked him to an International Free Agent deal of 6 YRs/$68 MIL in late 2013. This horse will be part of the stable until at least 2019! Posted on July 26, 2014, in MLB Roster Trees and tagged 2005 world champions, 2014 AL Rookie Of the Year predictions, 2014 white sox roster of hitters, a.j. schugel, aaron poreda, active leader for Home Runs on one team - 2014 (Paul Konerko), Adam Eaton, Adam Russell, addison reed, Adrian Nieto, al central, alejandro de aza, alex ríos, avisail garcia, boone logan, Brandon Jacobs, Brent Lillibridge, bryan villareal, carlos sanchez, chicago white sox, chris getz, chris sale, chris young, clayton richard, cleuluis rondon, Conor Gillaspie, daniel hudson, Daniel Webb, David Holmberg, dayan viciedo, dexter carter, edwin jackson, Francellis Montas, frank thomas, gordon beckham, hector santiago, jake peavy, Jason Frasor, javier vazquez, Jeff Soptic, jeffrey wendelken, joe borchard, jon gilmore, jordan danks, jose abreu, Jose Iglesias, josh field, kevin youkilis, Leury Garcia, Luis Vizcaino, Marcus Semien, mark mcgwire, mark teahen, masahiro tanaka, Matt Davidson, Matt Thornton, mike cameron, moises sierra, Myles Jaye, orlando hernandez, paul konerko, rich hahn, Santos Rodriguez, scott podsednik, Tyler Flowers, tyler skaggs, us cellular field, Zach Stewart. Bookmark the permalink. Leave a comment.